On November 10, Chinese musician Jay Chou won his fourth World Music Award, an international award given to musicians based on album sales. Chou won this honor because sales of his album On the Run, released in November 2007, ranked first in the Asian region, selling 1.07 million copies. Chou also won the award in 2004, 2006 and 2007, breaking the record of Chinese pop singer Jacky Cheung, who had previously won two years in a row. Born in 1979 in Taiwan, Chou is undoubtedly the most popular musician in Taiwan and on the mainland of China, especially among young people. Famous for his songwriting talent, Chou has been praised as a music genius by the media. He writes the music and lyrics for most of the songs on his albums himself, and he has also written songs for other Chinese singers. Chou became known for his avant-garde music style soon after he released his first album in November 2000. His first two albums contain genres ranging from rap and rock to traditional Chinese music, while his songs touch on themes including urbanization, violence and Chinese kungfu. 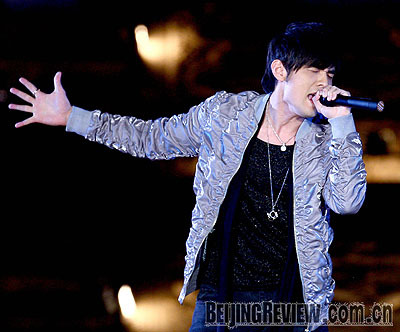 His creative ideas in music seemed to have no limits and he quickly became a rising star in Chinese music. Although some older listeners could not accept his new style of music-some prestigious artists have publicly said they could not hear his lyrics clearly-millions of young Chinese welcomed it. In eight years, Chou has won more than 200 major music awards, including best singer, best album and best single. Each album has maintained a strong Chinese flavor, which is an important element in Chou's music. Working with lyricist Vincent Fang, who wrote more than half the lyrics on Chou's albums, Chou infused many of his melodies and lyrics with a strong traditional Chinese feeling. One example is A Thousand Miles Away on the album Still Fantasy released in September 2006. Chou and famous Taiwanese singer Fei Yu-Ching, 53, sang the song together in totally different ways-Fei sings with a soulful style while Chou persists with his trademark R&B. The creative combination captivated both teenagers and their parents. Chou and Fei performed the song in 2007 during CCTV's Spring Festival Gala, a prominent variety show featuring the most popular songs of the past year. Even as he continued to release albums, Chou made the leap to the silver screen. In 2005, he played the lead role in the Hong Kong film Initial D, adapted from a Japanese cartoon series. Chou's acting debut increased his exposure to Japanese audiences. That role earned Chou the Best New Performer prize at Taiwan's Golden Horse Awards. Chou then appeared in Chinese director Zhang Yimou's blockbuster Curse of the Golden Flower in 2006, for which he was nominated for the Best Supporting Actor award at the 2007 Hong Kong Film Awards. In February 2008, Chou starred as a gifted dunker in Kungfu Dunk, which put his basketball talent on display. Not satisfied with acting alone, however, Chou wanted to be the man behind the camera. First, he tried to direct his own music videos. In 2007 he directed his first film, Secret, starring as a brilliant pianist who falls in love with a girl from the past. Apart from that, he also composed all the songs in the movie. Chou once told the media that directing gave him a greater sense of personal achievement than music. Another important turning point in his music career came when Chou and his friends founded a record company, JVR Music, in March 2007. By running this company, Chou said he hoped to help other young talents realize their music dreams. Chou's mother once recalled that as a child, he showed a keen interest in music even before he learned to walk. When Chou was 3 years old, his mother spent all their savings buying him a piano. At 4 years old, Chou formally began to learn piano, which opened the door to music for the little boy. He played the piano very well after several years of strict training, and his piano teacher in middle school later said that he could wing it as a teenager. But away from the piano, Chou was shy and talked little, and his classmates even thought he was mildly autistic. With music taking up most of his attention and energy, Chou's other courses suffered. At the end of middle school, he failed to enter a university. But just when he felt aimless, music saved him and since then has totally changed his life. In September 1997, Chou participated in a talent contest on TV in Taiwan, providing piano accompaniment to a friend competing for a singing prize. Although neither won the contest, Chou's talent for composing caught the eye of host Jacky Wu, who is an important figure in Taiwan's entertainment business. Wu invited Chou to join his music company and gave him a chance to compose for singers in the company. For nearly two years, Chou sat in the company studio writing songs late into the night. He also took the opportunity learning recording and sound mixing. But things did not go smoothly at first. Singers often rejected his songs, complaining they were too difficult to sing. But no pain, no gain. Chou eventually got a chance to sing his own songs and release an album. In November 2000, he released his debut album Jay, which includes 10 songs other singers had rejected. The album proved to be a big success. People were greatly impressed by this gifted young man and his new music style, known as Chou Style, which music commentators described as a fusion of R&B, rap, classical music and distinct Chinese flavor. Eight years later, Chou has firmly seized his position in Chinese music. The teen idol has been the focus of the media both at home and abroad, including CNN. He has numerous fans in China, Japan, South Korea and many other Asian countries. Chou has also become a fashion icon. He frequently appears in TV ads, on magazine covers and on various posters in the streets. He is very cool in the eyes of his fans, who imitate his habits, speech and dress. In the face of fame and wealth, Chou feels calm. Even today, he still feels shy when meeting the public and often does not know what to say to his fans. Chou admitted that he has not lost momentum so far, although his songs have been criticized for lacking change. Believing that staying true to his personality is the most important thing, Chou said he would continue to insist on making music that he himself likes. "Chou is crazy about work, which is the reason he has achieved so much," said Wu, the TV host. "He can work all day and night without sleeping. He is not a youngster who likes to play or pose in front of others. He is someone who loves art and lives for the stage." The Mei Lanfang biopic has great flavor, epic vision and genuine humor.